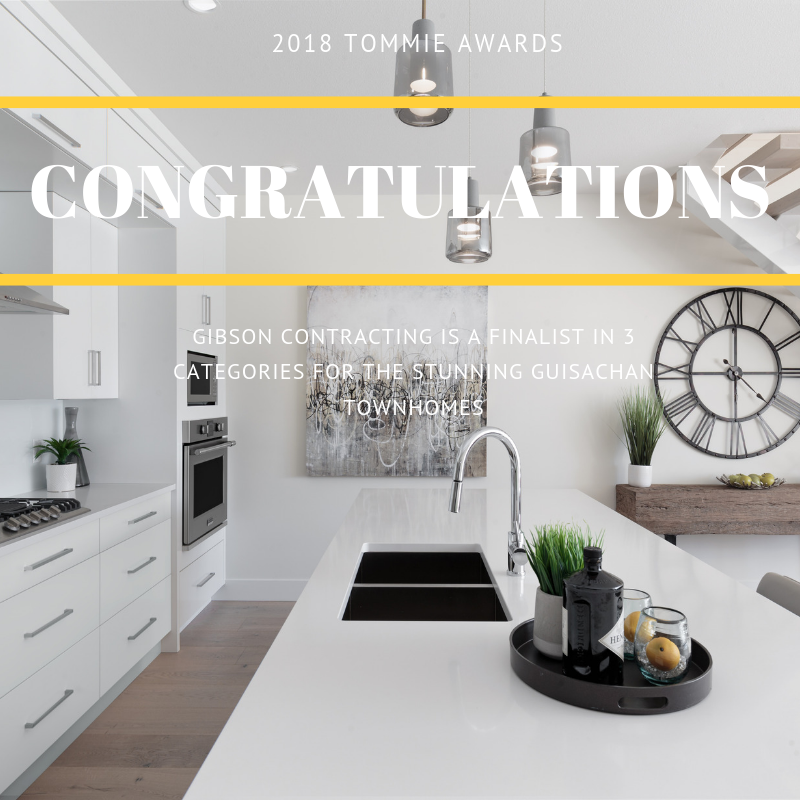 Gibson Contracting has taken home TWO Tommie Awards this year during the 2019 Okanagan Housing Awards of Excellence, previously known as the CHBA Tommie Awards ceremony for Guisachan Townhomes. Guisachan Townhomes won GOLD in the category of Urban Infill – Residential (Property Re-Use) as well as GOLD in the category of Show Home $500,000 & Under. The Tommie Awards are based on the cost of buildings excluding the cost of land. Darcy Gibson, leader of Gibson Contracting, wrote a heartfelt thank you to his team and the team in charge of building the luxurious Guisachan Townhomes. “I just want to take a minute and recognize my Gibson Contracting Team. Without all of you, none of what we accomplish would be possible. I am humbled to be able to get to work alongside those that I consider to be the very BEST in the industry. Not a day goes by that your commitment and hard work doesn’t go unnoticed and last night being recognized at the Tommie Awards are all thanks to each of you. Dreaming big becomes a reality when there is a team of highly motivated members working to achieve it. Its always been an honor working with you all and for this I THANK YOU! Only 3 brownstone inspired Townhomes Remain! Call us to book your exclusive walkthrough today. Our showhome is open Tuesday to Saturday from 4:30-6:00 pm or by appointment anytime.